New long-range ballistic missiles on show during massive parade celebrating country’s founder as US armada approaches. North Korea on Saturday displayed what appeared to be new long-range and submarine-based missiles at a massive military parade celebrating the 105th birth anniversary of the nation’s founding president, Kim Il-sung. 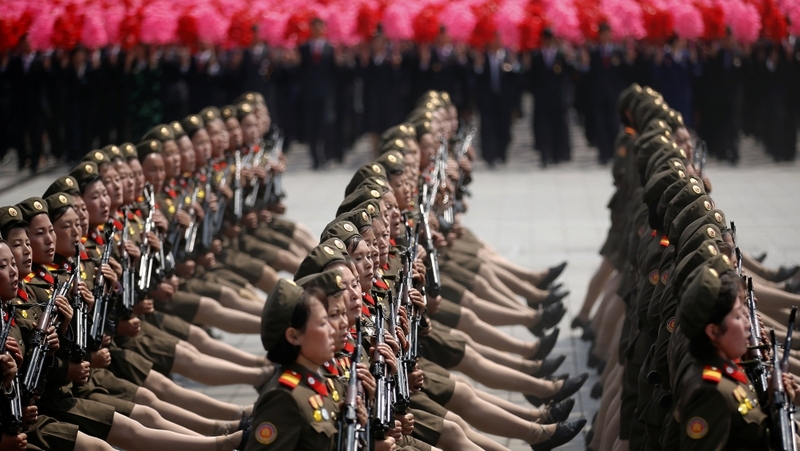 The parade, attended by leader Kim Jong-un, saw thousands of soldiers marching through the capital, Pyongyang. Weapons analysts said they believed some of the missiles on display were new types of intercontinental ballistic missiles (ICBM), enclosed in canister launchers mounted on the back of trucks. North Korea’s Pukkuksong submarine-launched ballistic missiles (SLBM) were also on parade. It was the first time North Korea had shown the missiles, which have a range of more than 1,000km, at a military parade. As a nuclear-powered US aircraft carrier group steamed towards the Korean Peninsula, a top North Korean official issued a warning against the United States during the ceremony. Choe Ryong Hae – widely seen by analysts as North Korea’s second most important official – said US President Donald Trump was guilty of “creating a war situation” by dispatching US forces to the region. “We will respond to an all-out war with an all-out war and a nuclear war with our style of a nuclear attack,” said Choe. Al Jazeera’s Nassir Abdulhaq, reporting live from the parade in Pyongyang, said that while it is usual for people in North Korea to mark this anniversary, the scale of this year’s event and the defiance of North Korea’s rhetoric was striking. “It’s clear that North Korea wants to flex its military muscles amid the recent threats from the deployment of US warships towards the Korean peninsula,” said Abdulhaq. State television showed Kim, wearing a black suit and white shirt, stepping out of a black limousine and saluting his honour guard before walking down a red carpet. He then walked up to a podium and clapped with senior government officials to address the thousands of soldiers and a massive crowd taking part in the parade. 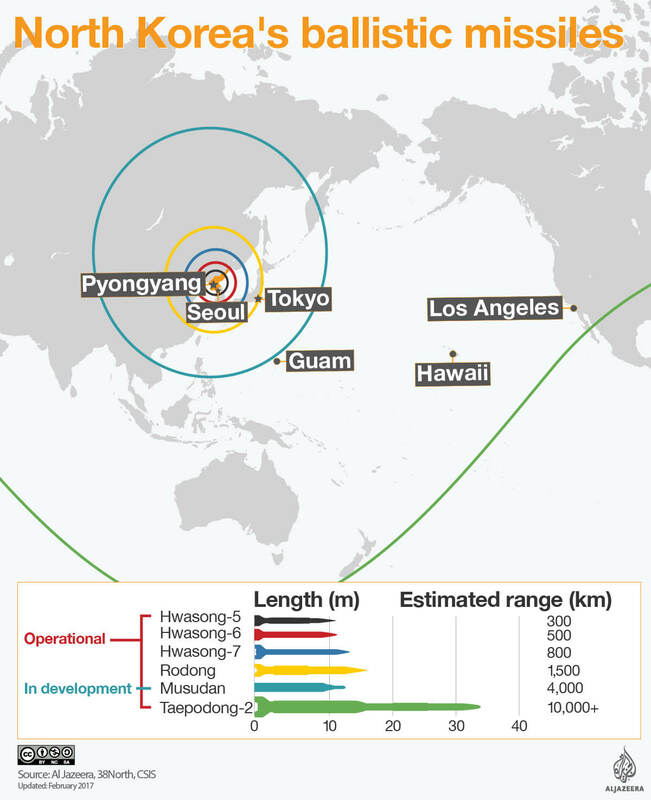 The display suggested that Pyongyang was working towards a “new concept” of ICBM, Melissa Hanham, a senior research associate at the US-based Middlebury Institute of International Studies at Monterey, California, told the Reuters news agency. “However, North Korea has a habit of showing off new concepts in parades before they ever test or launch them,” Hanham said. “It is still early days for these missile designs”. Joshua Pollack, editor of the Washington-based Nonproliferation Review, told Reuters that the display indicates North Korea is progressing with its plan to base missiles on submarines, which are hard to detect. “It suggests a commitment to this programme,” said Pollack. “Multiple SLBMs seems like a declaration of intent to advance the programme”. Al Jazeera’s Craig Leeson, reporting from Seoul, in the South, said Kim Il-sung’s birthday, also known as the Day of the Sun, is a day for celebration in North Korea, but also a day for analysts to observe the military parade. “What we’ve seen already is that it’s a very large parade. We had expected it would possibly be the largest that they’ve held,” our correspondent said. He said analysts are noting who is standing beside Kim Jong-un – on his right, the country’s second-highest ranking official, who heads the military, and on his left, the country’s premier. “What analysts believe is that this is sending a message that Kim Jong-un maintains his dual track policy,” Leeson said. In his annual New Year’s address, Kim said that the country’s preparations for an inter-continental ballistic missile launch have “reached the final stage”. Analysts say commercial satellite images from recent weeks indicate increased activity around North Korea’s nuclear test site. “All the brigandish provocative moves of the US in the political, economic and military fields pursuant to its hostile policy toward the DPRK will thoroughly be foiled through the toughest counteraction of the army and people of the DPRK,” North Korea’s KCNA news agency said, citing a spokesman for the General Staff of the Korean People’s Army. DPRK stands for the official name of North Korea, the Democratic People’s Republic of Korea. It said the Trump administration’s “serious military hysteria” has reached a “dangerous phase which can no longer be overlooked”. The US has warned that a policy of “strategic patience” with North Korea is over. US Vice President Mike Pence travels to South Korea on Sunday on a long-planned 10-day trip to Asia. China, North Korea’s sole major ally and neighbour, which nevertheless opposes its weapons programme, on Friday again called for talks to defuse the crisis. “We call on all parties to refrain from provoking and threatening each other, whether in words or actions, and not let the situation get to an irreversible and unmanageable stage,” Chinese Foreign Minister Wang Yi told reporters in Beijing. Jim Walsh, a research associate at the Massachusetts Institute of Technology, told Al Jazeera that he believed North Korea would conduct a nuclear test but said it was unlikely that the US or its allies would respond militarily. “I don’t think [the US would] be sending the vice president to Seoul if they were going to respond militarily…also the US policy review on North Korea was concluded last week and basically ruled out military options,” said Walsh.